One of the places I love frequenting in Okutama, Tokyo is the rather obscure Kurasawa Valley a lazy 20-minute bus ride from Okutama Station. Flanked on either side by precipitous cliff faces it was once home to the secluded Kurasawa limestone tourist cave and the tiny village of Kurasawa. Nowadays apart from the odd dirt bike tearing along the valley’s poorly maintained forestry road it seems few people bother to pay a visit. This is a shame as the valley has several excellent waterfalls to savour albeit from a distance as accessing the river bank is a tad tricky. It’s also worth mentioning that the Kurasawadani Creek which snakes through the valley is good place to partake in the adventurous if not mildly dangerous activity of sawanobori or stream climbing. 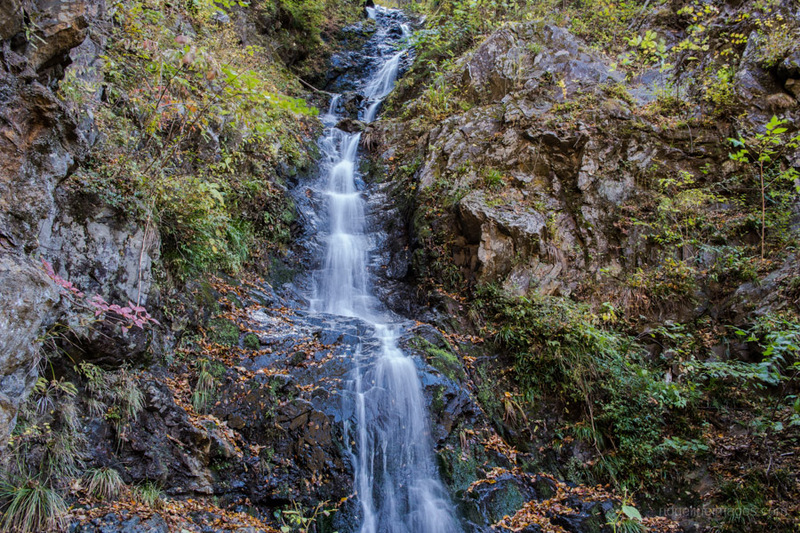 About a 40-minute hike in along the forestry road finds this approximately 25 metre (82 ft.) high waterfall. Interestingly from what I could garner online it remains unnamed. When I came across it recently there was no one around making it a wonderful subject to quietly photograph on what as a delightful autumn morning. A waterfall without a name. The waterfall is around 25 metre (82 ft.) high. Scattered autumn leaves at the base of the waterfall. I think I’ll be going there during this years golden week.